Saturday of the Thanksgiving weekend was made memorable by a wonderful and well-attended concert given in Lexington’s Follen Community Church, a lovely suburban venue with a reputation for presentation of music at a very high level. So, it was no surprise that the redoubtable Peggy Pearson, oboe virtuosa extraordinaire, and the leader of Winsor Music, an organization she founded in 1996, chose Follen as the location of what turned out to be a very special concert indeed. Of late, the nurturing of promising young musicians by seasoned professionals, leading to public performances of chamber music repertoire has been important to the organization. On the evidence of this season’s first two concerts, it’s clear that these young musicians thrive in the collaborative environment they inhabit as they perform in Winsor’s concerts. Such was very much the case this past Saturday. 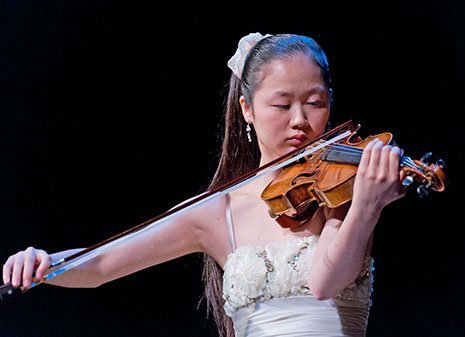 Yuki Beppu, a talented young violinist who has soloed with the Boston Philharmonic and the Lexington Symphony Orchestra played handsomely in a performance of the J.S. Bach Trio Sonata in C, BWV 1037, now almost universally attributed to Johann Gottlieb Goldberg, the person whose name is associated with Bach’s universally admired namesake keyboard Variations BWV 988. The sonata was originally scored for two violins and continuo. This evening Beppu and Pearson each played treble parts, with Rafael Popper-Keizer, cello, and Peter Sykes, portative organ as the sensitive continuo underpinning. This was no early music performance—there was plenty of expressive vibrato employed by the strings. Beppu’s tone was refulgent; perhaps a bit ripe for Bach, yet despite this and her somewhat aggressive bowing, her admirable musicianship and involvement with the score allayed most of these concerns. Next up was the Boston premiere of John Harbison’s Crossroads, its music set to three poems by Louise Glück, who was present in the audience for this performance. This music is Harbison’s third setting of Glück’s poetry, verse that is obviously of great appeal to him. In a brief talk, Harbison explained that the piece exists in differing instrumentations dependent upon which of the cooperating members of the commissioning consortium were to give their local premieres. The work had been heard earlier in La Jolla, California (where Pearson had given the world premiere), Santa Fe, New Mexico, and Minnesota, where the St. Paul Chamber Orchestra had performed an orchestral version. Saturday’s version of Crossroads employed oboe, two violins, viola, cello, bass, and soprano. The wonderful vocal artist Kendra Colton—fearless, rock-solid and seemingly undaunted by the vocal line’s many challenges of pitch and disjunct melodic line—clearly projected the poetry’s texts with clarity of enunciation and singular beauty of tone. Crossroads, in common with much of Harbison’s music, is skillfully crafted, stimulating to the ear, clearly voiced, expertly orchestrated, and cannily constructed. It was interesting to hear the composer describe in unusual detail how he had composed this music. The final order of movements is not the order in which they were written. This is not unique to Harbison, of course, but his fascinating description of how one movement was the creative “cause” of another movement gave the audience an unusually intimate view into his compositional process in this new work. And, if it were possible to leave the hall where a new music work has been performed and actually hum a tune remembered from the concert, this was one of those times. Harbison’s beguiling and thrice-heard instrumental “refrain” stubbornly but welcomely remained in my mind for many hours. I look forward to hearing this attractive score again. Following intermission a verifed work of J.S. Bach was offered, the wonderful Cantata BWV 199, “Mein Herze schwimmt im Blut” (My heart swims in blood). In his third brief but informative talk of the evening, Harbison reminded the audience that this work was one of Bach’s big Weimar pieces from 1714. It was an obvious favorite of Bach’s, as he repurposed much of the cantata’s music in different guises several times later in his career. The unusually dramatic text was largely written by Georg Christian Lehms, an author whom Bach clearly favored and employed in several cantatas. In Cantata 199 Lehms’s verse is rife with rich and impactful images, and Bach’s setting proves particularly challenging for the vocal soloist, usually sung by soprano. Harbison alluded to the present belief that the original singer may have been an operatic mezzo-soprano. Kendra Colton brought to this ever-remarkable music her gifts of clear language declamation, dramatic vocal colorings as befitted the texts, and her cherishable constant involvement with the music’s many nuances. Peggy Pearson’s nonpareil oboe playing throughout was a joy, and was especially poignant in the No. 2 Arie und Rezitativ: Stumme Seufzer, stille Klagen (Mute sighs, silent cries). The entire accompanying ensemble of Pearson, oboe, Heidi Braun-Hill and Yumi Okada, violins, Noriko Herndon, viola, whose obbligato romp in the No. 6 Chorale was zestily played, Rafael Popper-Keizer, cello, Susan Hagen, bass, and Peter Sykes, organ, were with Colton all the way, hand-in-glove—wonderfully collaborative, equal partners in this deep work of spiritual guilt and ultimate redemption. Pamela Dellal’s elegant translation of Lehms’s verse (Johann Heermann wrote the words of Verse 6) surely added to the audience’s appreciation of this compelling score. In short, there was much to admire in this second offering in Winsor Music’s series of concerts this season. Readers ought not to miss Winsor’s forthcoming offerings. Visit www.winsormusic.org for information about this enterprising organization.